Rent San Geronimo Golf Course | Corporate Events | Wedding Locations, Event Spaces and Party Venues. 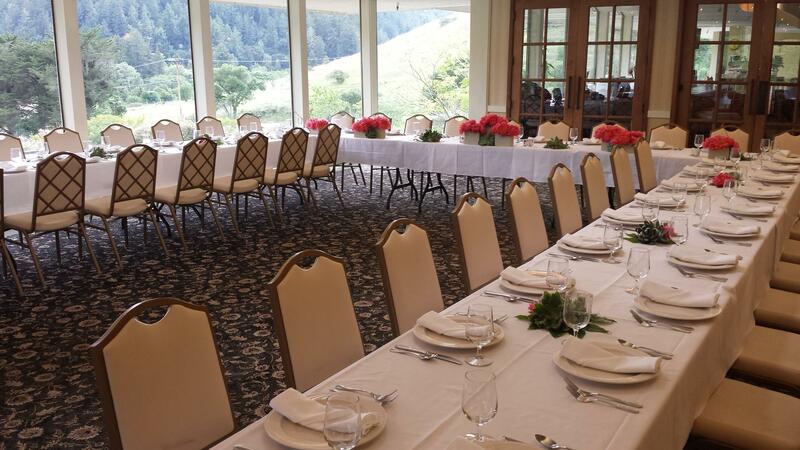 San Geronimo Golf Course, nestled within the giant redwoods, untouched mountains, and cascading creeks of Marin County, is an idyllic venue for weddings and receptions and all other special occasions. We offer five event spaces to choose from, including our recently renovated clubhouse. With floor-to-ceiling windows, our clubhouse allows the soft glow of the southern light to pour through and illuminate the banquet space. The panoramic view from the clubhouse is equally captivating, overlooking the unadulterated beauty of Marin County’s picturesque valley. Just outside the clubhouse, we provide a number of grassy areas perfect for an outdoor ceremony, cocktail hour or reception. Guests will enjoy catering through our award-winning kitchen. Our Executive Chef, Rich Treglia, personally prepares all meals to ensure that your guests’ dining experience is perfect. He can also design a customized menu according to your exact preferences and tastes. Our event experts will help you plan your function to your specific tastes, requests and budget. We have experience arranging events which include: anniversaries, Mitzvahs, Quinceaneras, birthdays, graduations, baby showers, and celebrations of life. From over 200,000 wedding vendors, San Geronimo Golf Course was the only venue that was recognized in all of Marin County and 1 of only 25 wedding venues in the entire Bay Area.